If you think watching someone play piano for 90+ minutes might be boring, I'll advise you to give Grand Piano a look. Elijah Wood stars as Tom Selznick, a young piano prodigy returning to the stage years after a disastrous performance forced him out of the spotlight. If his much anticipated return isn't stressful enough, he discovers a note from a sniper (John Cusack) scrawled across the score threatening his life if he plays a single note incorrectly. What follows is a tense and fun film that just skirts the edge of ridiculousness and never takes itself too seriously. The strengths of the film lie with its lead Elijah Wood who is on screen nearly every minute of the film. His performance is excellent, one of his best, and is believable from every minute. He's charming and as the film progresses you feel his nerves and his fears. The script from Damien Chazelle is clever and makes what seems like a ridiculous plot work pretty great. This is also in part thanks to the direction of Eugino Mira. It's a really well shot and well directed film and it moves at a breakneck pace with no lull whatsoever. That said, it's not flawless. I really only had one scene that I did not like and it is when Tom's wife sings from the audience. I get why they did it I just think there should have been a more believable, less sort of ridiculous way to go around it. The blu-ray looks pristine with some gorgeous colors and top notch sound and there are some pretty interesting special features that give you a nice glimpse into the production and the effects. Overall, Grand Piano is an exciting and fun ride that makes for a nice entertaining watch. 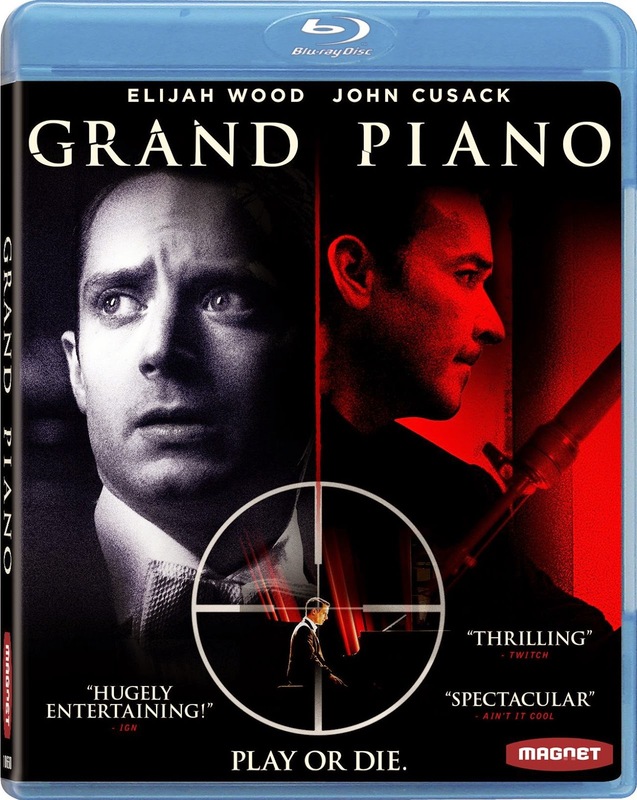 Enhanced by a great starring performance from Elijah Wood and a smart script, Grand Piano is worthy of a spot on your shelf. Grand Piano is available on DVD and Blu-ray now.